Busan is a city of beautiful beaches, glamorous night scenes, and modern history. As the second largest metropolitan area in Korea, it has been announced as Lonely Planet’s number 1 in “10 Best places to visit in Asia in 2018”. The biggest advantage of touring Busan is that most of the main attractions are easily accessible by subway. Travelers with a tight budget can purchase a one-day pass for unlimited rides on Busan subways within the same day. With a ticket in hand, set out for a full day of fun and delicious food in Busan! 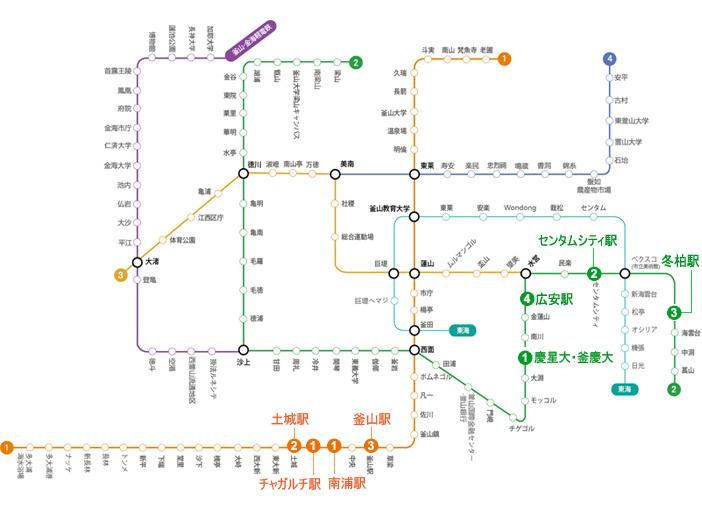 The subway system in Busan consists mainly of six different lines: Lines 1 to 4, Busan-Gimhae LRT connecting Busan to Gimhae, and the Donghae Line covering the coast from Seo-myeon through Haeundae to Ilgwang. Most travelers arrive in Busan through Gimhae International Airport, Busan Station or Busan Bus Terminal, which are connected to Gimhae International Airport Station (Busan-Gimhae LRT), Busan Station (Busan Subway Line 1), and Nopo Station (Busan Subway Line 1) respectively. 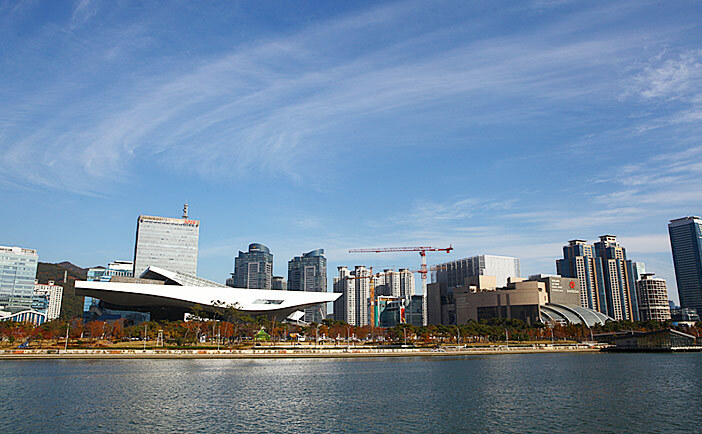 We recommend purchasing the one-day pass to start your tour of Busan as soon as you arrive. The one-day pass allows unlimited rides on the same day of purchase for all subway lines except the Busan-Gimhae LRT and Donghae Line. Tickets cost 5,000 won each, and are available at all ticket vending machines located inside of the city's subway stations. The ticket machines offer assistance in Korean, English, Japanese, and Chinese for the convenience of international travelers. To purchase a one-day pass, simply select the designated button at the bottom right-hand side of the machine. However, keep in mind that these machines only accept payment by cash in the form of 1,000 won bills and 500 won and 100 won denomination coins. If you happen to run out of smaller bills, simply ask for an exchange at the station office or use a money exchange machine to break down larger bills. 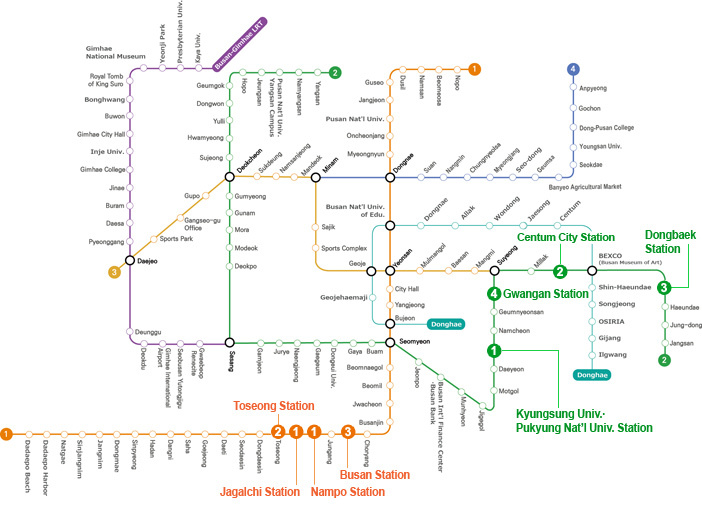 There are a number of large markets along Busan Subway Line 1. The most famous markets are Jagalchi Market, the largest seafood market in Busan; Gukje Market, which provides imported merchandise through Busan Port; the areas around Nampo-dong Street, Bupyeong (Kkangtong) Market, and BIFF Square, which attract people with their many unique food stalls and stores to check out. Bupyeong Kkangtong Market’s top three foods that are popular among foreigners are yubu (fried tofu) pockets, ssiat hotteok (seed-stuffed griddlecake), and bibim dangmyeon (spicy glass noodles). Yubu pockets are served in a warm seafood and vegetable broth with fish cakes and have just the right combination of sweet and salty. The dish has no meat, making it a popular choice for vegetarians. Another dish great for filling up on is bibim dangmyeon. This simple dish includes glass noodles, sliced fish cakes and vegetables, topped with a spicy sauce. 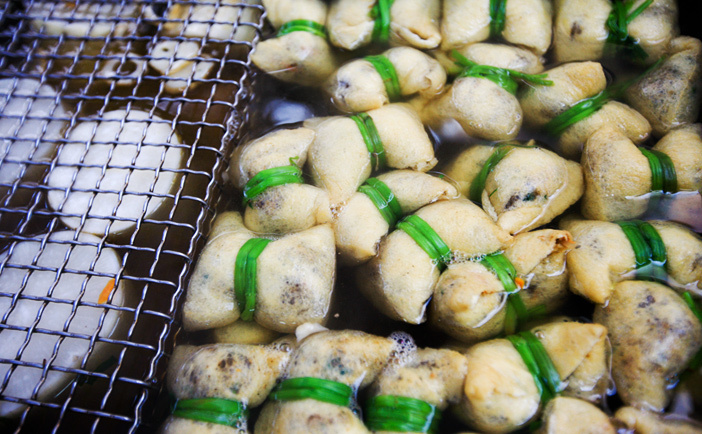 If you’re looking for something a little sweeter, try the ssiat hotteok. This sugary, warm pancake is fried on a hot griddle and then cut up and filled with a variety of seeds and black sugar. Gamcheon Culture Village feels like a village out of a fairytale and is only a 20-minute walk from Toseong Station, Exit 8. 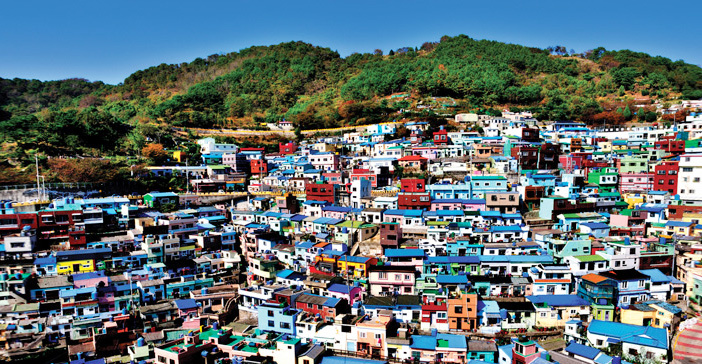 This terraced village is on a mountainside overlooking the ocean, giving it the nickname “The Santorini of Busan.” The neighborhood is filled with small galleries, craft shops, and cafés with amazing views, perfect for new discoveries. The colorful buildings also make for outstanding photos. To make the most of your time, stop by the Gamcheon Culture Village Information Center to purchase a stamp tour map (2,000 won / available in English, Japanese, and Chinese) before you head out! The entrance to Busan’s Chinatown greets its tourists with a large red gate, giving it the nickname Shanghai Street. Other Chinese-influenced aspects of the area include uniquely designed street lamps and buildings. The backstreets are lined with Chinese restaurants, selling everything from Chinese donuts and dumplings to fortune cookies. 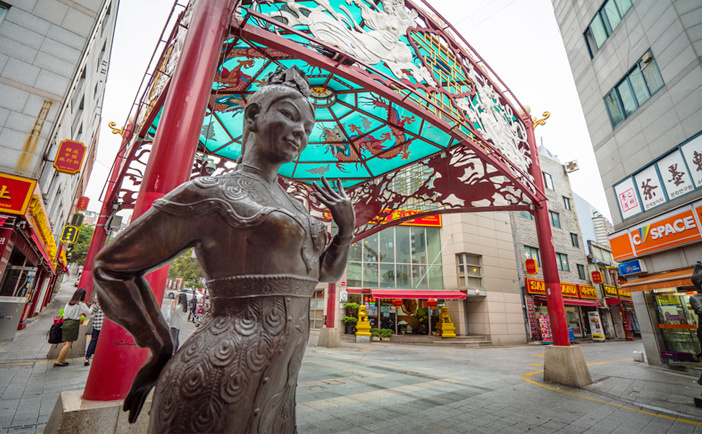 Chinatown is located just across the street from Busan Station, making it convenient to visit if you’re in the area. After a short 15-minute taxi ride from Kyungsung Univ.•Pukyung Nat’l Univ. Station of Line 2, you will soon arrive at Oryukdo Skywalk. 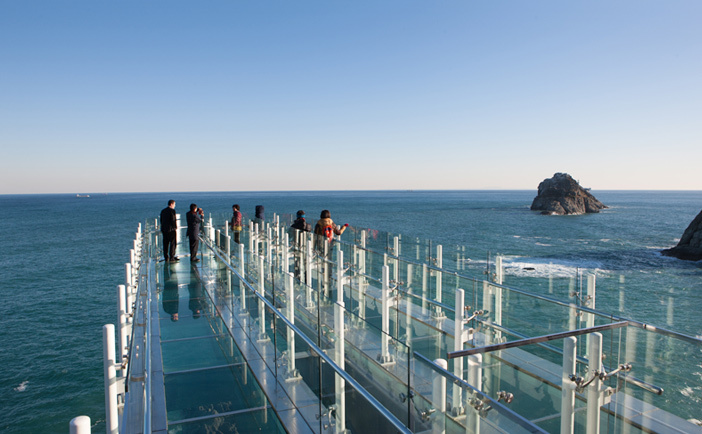 This skywalk is favored by many who wish to experience walking above the sea. The floor of the skywalk is completely made of glass and you can take in the unobstructed view and ocean breeze of the sea. Nearby attractions include Igidae Park, Galmaet-gil & Haeparang-gil Trail for enjoyable trekking along the coast. As the world’s largest department store, Busan’s Shinsegae Centum City features various brands, including luxury products. Visitors can also enjoy the delicious tastes of some of Seoul’s most famous restaurants. In addition to shopping, visitors can enjoy all aspects of entertainment, from a movie theater to a large bookstore, an indoor ice skating rink and even a Korean-style spa called jimjilbang. The nearby Busan Cinema Center, the venue of Busan International Film Festival, is also worth a visit. Busan is close to the ocean and has many beautiful nightscapes. 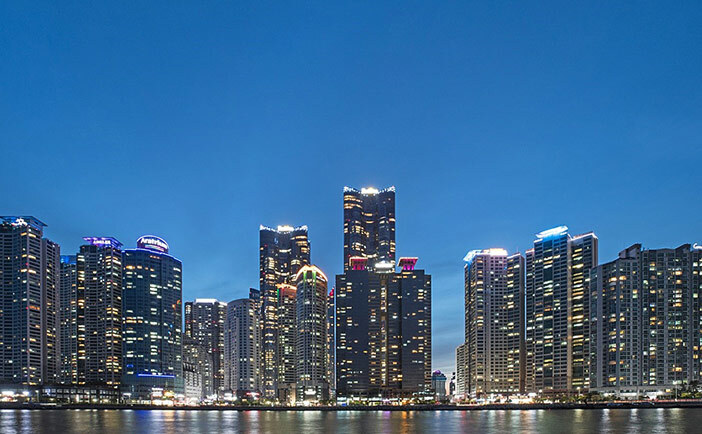 The Bay 101, in particular, has become one of the hottest places for viewing Busan’s skyline at night. The facility is a yacht club equipped with a café, gallery, restaurants and more. The outdoor tables on the rooftop terrace that are open year round, excluding winter, serve as the perfect place to enjoy a delicious meal or drink with friends. Nurimaru APEC House, where the APEC summit meeting was held, is also located nearby on Dongbaekseom Island, perfect for an evening walk. The view of Busan’s landmark Gwangandaegyo Bridge at night cannot be missed. The bridge, Gwangalli Beach, and Haeundae’s Marine City line up to create one fantastic landscape. Gwangandaegyo Bridge is also the venue for the popular Busan Fireworks Festival that takes place each fall. * This column was last updated in September 2018, and therefore information may differ from what is presented here. We advise you to check details before visiting.